Geez you’ve done such a tremendous job on our first anniversary how are you ever going to top it??? The sweetheart took the initiative to plan the festivities for our first anniversary and man was he ever thoughtful!!! Fine, he didn’t really say it verbatim but it was totally along the lines of that. I asked him if it was close to a skytrain station, he said yes, but of course when I tried to guess which station he didn’t give anything away. So when we got off at Stadium-Chinatown, I thought “Oh maybe it’s Baobei“. “Oooh! Mussels!! !” I exclaimed excitedly. “Oh you know of this place?” he sounded disappointed. He smiles and opens the door. After checking in, we were lead through what we thought was the entire restaurant, towards a narrow corridor which houses the kitchen outlet, to a bigger brightly window-lit dining room in the back. We were then seated in a cozy corner right by the huge window. 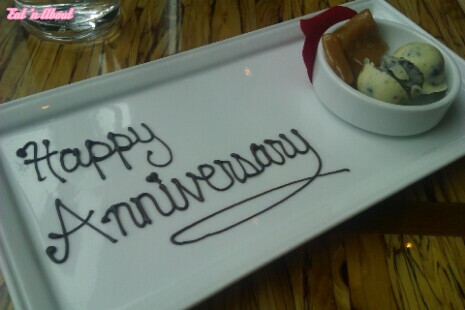 The note of “Anniversary Dinner” should have something to do with this arrangement. I’m impressed. More smiling, at which point a server with an accent (they ALL had accents. I swear they only hire foreign men here but hey I’m not complaining. Not one bit.) presents me with a cocktail. 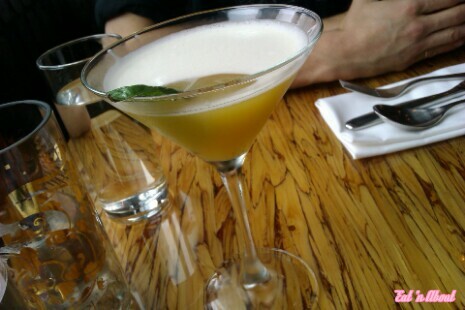 “It’s got Thai basil in it.” says Hitman. I’m starting to get the feeling that there’s a thought and a reason behind his choices. Aside from cilantro, basil is probably the other herb I constantly rave about, as does he, and Thai is special to him too. The cocktail was intensely refreshing on this grey, rainy day. Citrus-y and tropical, gave me a nice warm buzz. Could be the alcohol though. Or just the giddiness. Or the awe of what’s happening. Later a different server with an accent came and gave us two bowls. “In case you guys want to share the mussels.” he says. Turns out he (or any of the servers for that matter) wasn’t supposed to spill the surprises of the night, and Hitman got anxious but realized that since I knew this place was known for mussels, it wasn’t too big of a surprise to spill. I assured him of that. 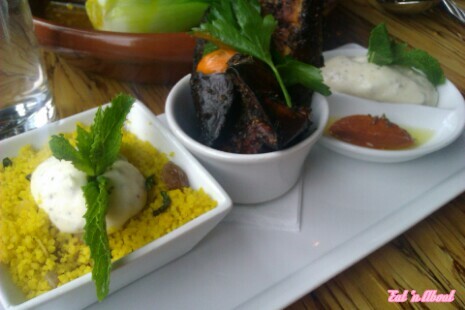 So came the star of the show – the Mussels. Only my favorite herb in the world. I’ve told him before that I don’t need flowers. A bouquet of cilantro was enough. 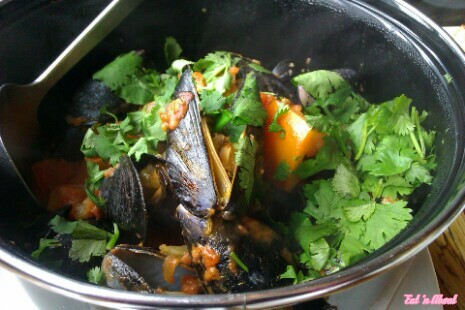 He went a step further and included mussels with it too. As expected the mussels were excellent and there were a healthy amount of them. They were done just right and we did not find any unopened ones. The broth was excellent also. Lots of big chunks of tomatos and onions and probably leeks. And of course, cilantro ♥. 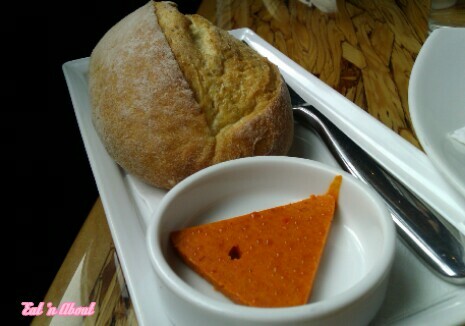 We were brought a bread roll for sopping up of the broth. Oh my god the bread roll…. Served with paprika butter, I had trouble deciding whether I wanted mussel broth or the smoked paprika butter with it. The butter was just that- smoky with paprika flavor that was just divine. And the reddish-orange hue was so pretty! The frites that came with the mussels were accompanied by a aioli…honestly I didn’t pay much attention to this as there was a lot going on at the same time. 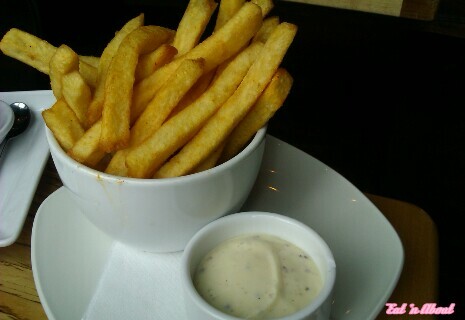 The frites were definitely fresh though but cooled down quite quickly. I dipped a few into the broth but the bread was a better use for that purpose. 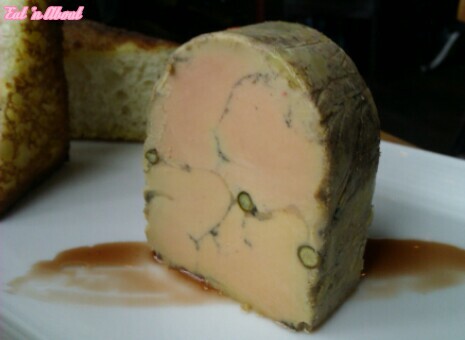 Spiced foie gras terrine, port reduction…looks like a tombstone eh?? We both pondered for a while what the red thing is. 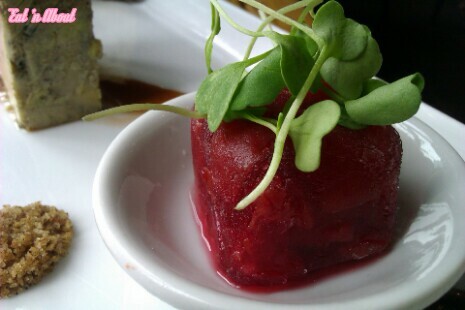 I concluded that it must be a palate cleanser to alleviate the indulging richness of the terrine. A quick google menu search informs me that kriek is a belgian beer made with sour cherries. It wasn’t overly tart though. I actually didn’t notice any tartness at all. By this time I had almost finished my cocktail. Accented server came by to ask if I/we had a beer in mind for the next dish. Hitman was once again horrified that they’ve let out the secret again. However I was actually too engaged with the accent to really notice what he was saying. All I remember was Hitman asking him to decide on a beer for me, and me requesting for nothing too bitter. 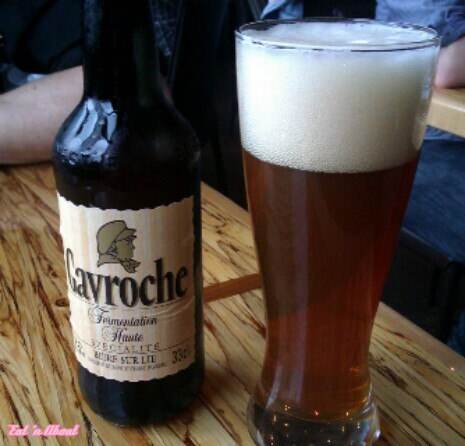 Accented server came back with Gavroche which supposedly has a caramel finish. I couldn’t detect this though. And it was a bit too bitter but that’s just my taste. Then came the main entree. 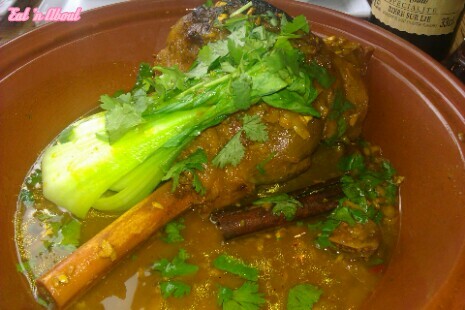 I didn’t know what it was until the lid of the tajine was lifted….and it was my favorite meat of all time combined with my favorite herb of all time!!! Lamb! Cilantro!! The shank was just so tender. We didn’t even need a knife to eat it, just pulling it off the bone with a fork was good enough. It was juicy and flavorful and even though I thought the sauce would be too sweet due to the figs, it wasn’t and it completely complimented the spices used. Hitman was equally impressed with the dish. He said that with each taste of the lamb he can taste a different exotic spice. The zalouk, which is a cooked salad of mainly eggplant, was creamy and spicy. Hitman did comment that the skin was a bit too salty but it was ok for me. It had a really nice smoky flavor. For dessert Hitman went for a different route…instead of the usual cheesecakes and chocolate mousses (which I was eyeing all through dinner) he opted for a cheese platter. An interesting change. At first I wasn’t that open to it…I want my cheesecake! But when it arrived, I’m so glad he picked this. It was ginormous by the way. Served alongside various dried fruits and nuts as figs, apricots, candied pecans (which REALLY impressed Hitman), fresh pear and granny smith slices, from the bottom were the cheeses St-Paulin, Keen’s, and St-Agur blue. 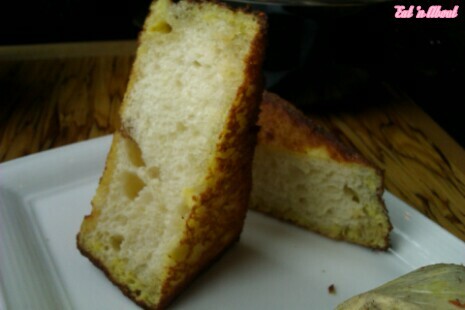 The first one, St-Paulin (Quebec) was soft and buttery, but very mild in flavor. It ranked 3rd in my books. The second one, the Keen’s (UK) was an aged cheddar, almost like a parmasan cheese in texture. It was also more flavorful too. and paired well with the honey. 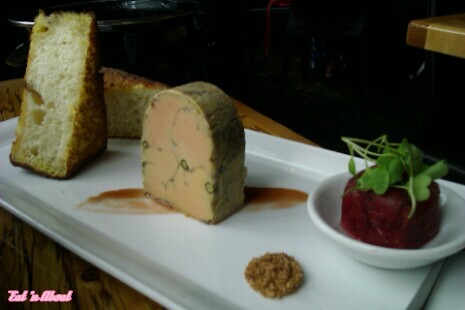 My favorite though was the St-Agur blue cheese (France). 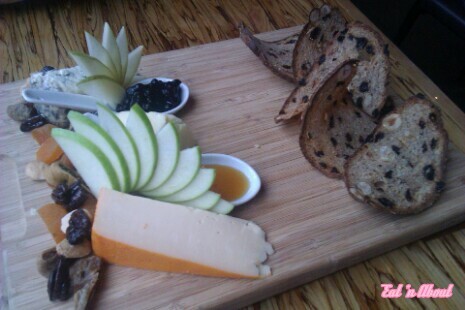 It was creamy but not as overpowering as other blue cheeses I’ve had before. Delicious with the blueberry compote. It was a truly wonderful and extremely thoughtful dinner celebration, more than I had/can ever hope for. It was truly a surprise and I am so appreciative of the thought and energy Hitman put into planning this. I loved reading about the surprise! Will check out ths restaurant one day.